Key West is a teeny tiny island, and it’s warm community feel make it an obvious draw for visitors from around the United States, as well as globetrotters around the globe. The allure of the seaside, the finest in tropical eateries, endless bunches of palm trees, the fragrance of fresh fruit, Key West is a delightful assault on the senses. But you can’t enjoy that from the confines of an air conditioned car or bus. And who wants to spend the better part of their holiday hunting around for the elusive parking spot in one of the busiest island cities on earth. 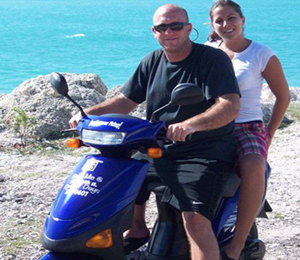 Leave the car on the mainland, and opt for a fun key west scooter rental instead. With Key West’s array of narrow alleyways, you have the privilege of really exploring them because of your accessibility. Most cars are not able to navigate them, and when they do, they’re not able to stop and chat with a jovial local or peruse the unique selection of quaint shops. 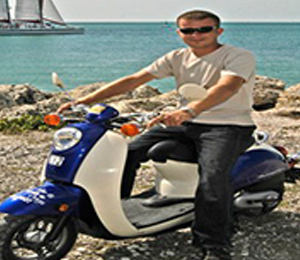 With one or two seater options available, guests can enjoy the convenience of a key west scooter rental for a few hours or longer if they wish. If you’re making Key West your home base for a spell, snag yourself a weekly rental. Avoid all the hassle of looking for a parking spot and opt for one of our small and compact scooters! 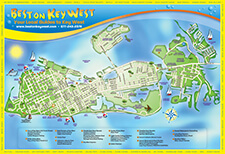 This is the easiest way to travel around Key West from one destination to the next. Forget the hassle of searching for the much sought after parking spot in Key West. Opt for one of our small, compact and comfortable 2 seater scooters! These scooters will get you around the island and find you parking spots in no time! If you are looking for a fun way to explore the charming streets of Key West, Florida, rent an economical and speedy scooter from us. These easy-to-ride vehicles are fuel efficient, fun, and much easier to park in this tourist town than a car. Feel the tropical breeze blow through your hair as you zip along on a scooter. Need help booking your tour? Need help booking your tour? Our professional and local staff is here to help. Contact a Best On Key West representative by calling (877) 243-2378 or click the live chat button to right.